“Cry out forcefully: violence and war are never the way to peace!” Pontiff urges. More than a hundred thousand people gathered in St Peter’s Square on Saturday evening to hear Pope Francis make an impassioned appeal for peace in Syria. The four-hour prayer vigil was called for by the Pope at last Sunday’s Angelus in which he signalled his desire for the world’s 1.2 billion Catholics to undertake a day of fasting and prayer for peace in Syria. It was made as the world’s political leaders continue to consider their response to the chemical gas attack in Damascus on 21 August which left hundreds of people dead. The US and France appear to back military action against the Assad govenment which they believe was behind the attack. Others, such as Russia, have cautioned against military action in the absence of definitive proof that the Assad regime was responsible and the lack of any UN mandate for a military response. In his homily, the Pope made a heartfelt call for the “noise of weapons to cease”, warning that war always marks the failure of peace and is always a defeat for humanity. “Let the words of Pope Paul VI resound again: ‘No more one against the other, no more, never! … War never again, never again war!’ ‘Peace expresses itself only in peace, a peace which is not separate from the demands of justice but which is fostered by personal sacrifice, clemency, mercy and love’,” he told the massive crowd which had been assembling since 5.45am on Saturday morning. 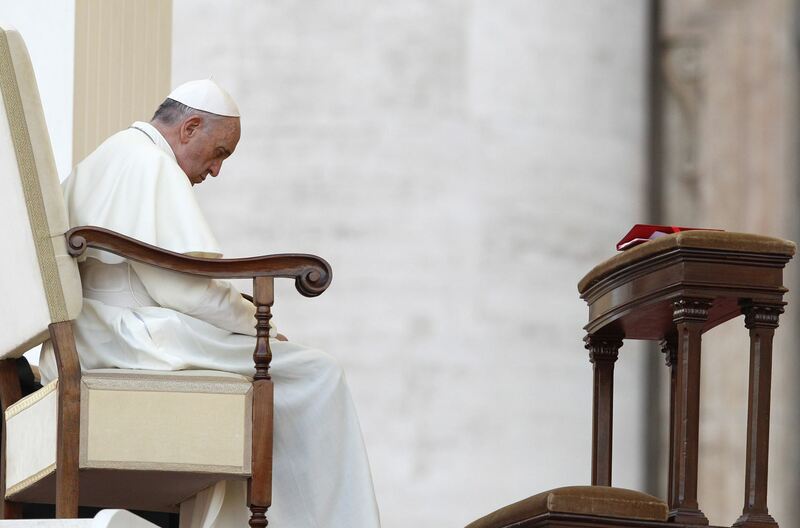 The 76-year-old Pontiff also urged all those assembled, and those who joined in prayer and solidarity at vigils in churches and parishes around the world, to work for reconciliation and peace. “When man thinks only of himself, of his own interests and places himself in the centre, when he permits himself to be captivated by the idols of dominion and power, when he puts himself in God’s place, then all relationships are broken and everything is ruined; then the door opens to violence, indifference, and conflict,” the Pontiff warned. The prayer vigil began at 7 pm with a greeting from the Pope and the singing of the ‘Veni Creator’, followed by the enthroning of the image of the Virgin as ‘Salus Populi Romani’ carried by four Swiss Guards. The Pope began by praying the Rosary; each mystery of which was accompanied by the reading of a poem by St Therese of Lisieux about the child Jesus, and at the end the Pope invoked “Mary, Queen of Peace, pray for us”. Following the Pope’s homily, a moment of silence was observed during the preparation of the altar for the exposition of the Holy Sacrament. The adoration was accompanied by a biblical reading on the theme of peace, followed by the Pope’s prayer on this subject and a responsorial invocation as a plea for peace. At the end of each of those moments, five pairs of people, representing Syria, Egypt, the Holy Land, the US and Russia, placed incense in the censer to the right of the altar. At the conclusion of the ceremony, Pope Francis imparted his Eucharistic blessing to those present. Earlier on Saturday, the Pope wrote to his nine million followers on Twitter, “Pray for peace”. On Saturday evening in Lourdes, Archbishop Diarmuid Martin of Dublin led 2,000 Irish pilgrims in prayer for peace in Syria at St Bernadette’s Church. The Archbishop said that with Pope Francis and the whole Church, the pilgrims were praying in a place of extraordinary serenity for peace in Syria and for peace in the world. At the same time, Bishop Eamonn Walsh led an evening of prayer for peace at St Mary’s Pro Cathedral in Dublin with Mass, followed by exposition, benediction and night prayers. Prayers services for peace were also held in individual parishes throughout Saturday across the country.